Man Cave Rules [G5095] - $10.00 : Yarn Tree, Your wholesale source for cross stitch supplies. Cross stitch pattern by Sue Hillis Designs. 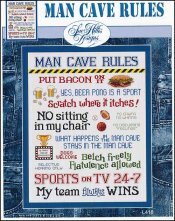 Common male phrases including "NO sitting in my chair," "Selective Hearing Only," and "Sports on TV 24-7" accented by sports equipment, a hamburger, and other man cave motifs. Stitch count 189 wide x 234 high.